Darcy Cotterill is content with her life. She loves her Nantucket Island house, which she inherited from her paternal grandmother, and her job as assistant director of the children’s library of the Nantucket Atheneum. Her social life is busy and satisfying. She has a best friend in Jordan Morris and a place in Jordan and her husband Lyle’s circle of young married couples and singles. For the past several months, one of that group, Nash Forrester, has pleasantly filled Darcy’s thoughts and many of her nights. She even looks forward to the changes the influx of summer visitors will bring to the island. But Darcy has no idea of the changes one summer will bring to her life. The first indication that this summer will be different comes with the recognition that the family renting the house behind Darcy’s is not unknown to her. Her former husband, Boston real estate mogul Boyz Szweda, his wife Autumn (the woman with whom Boyz had an affair while he was married to Darcy), and Autumn’s fourteen-year-old daughter, Willow, are Darcy’s summer neighbors. Darcy’s typical relationship with her summer neighbors is usually friendly but distant, but she soon finds herself involved not only with Willow, who is facing the temptations of a teen with too little parental supervision, but also with her summer neighbors on either side: Mimi Rush, an elderly woman with an indomitable spirit who reminds Darcy of her grandmother, and Susan Brueckner, the overwhelmed mother of three energetic young sons. The four create a circle of friendship that bridges the differences of age, experiences, and lifestyles. The power of these friendships pushes Darcy's off-season life into the background. Darcy’s relationship with Nash is more turbulent. Darcy longs for more of a commitment than Nash seems willing to offer, but at the same time she cannot deny the attraction she feels for Mimi’s grandson, handsome, interested, and available. Only when Nash seems lost to her does she realize how much he means, but even a second chance does not resolve all their conflicts. Will Darcy have to choose between the man she loves and the house that has been her sanctuary for most of her life? 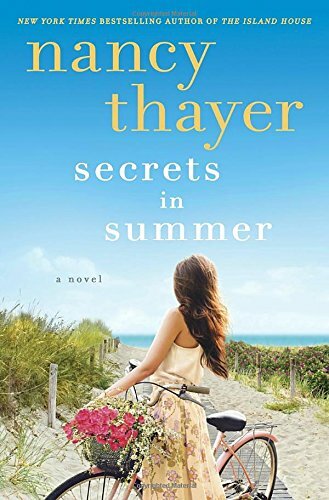 Secrets in Summer is a women’s fiction novel that provides an entertaining look at one season in Nantucket. Thayer creates a strong sense of this particular place, and the unusual company of female friends offers the book’s best moments. Nash is an interesting character, but romance readers may be disappointed in the slightness of the romantic thread. I also suspect that, despite the general sweetness of Darcy and Nash’s relationship, many romance readers will be put off by the commonness of infidelity in marriages ranging from that of Darcy’s parents to her own to those of her summer neighbors. Perhaps the story targets an audience more sophisticated than I am. If you are a fan of popular “beach reads,” you may find a few hours in this summer world worth your investment of time and dollars. I happen to be naive too. Life is difficult for those of us affected by infidelity. Reading about it does not appeal. I normally like Nancy's books. Nash doesn't sound like someone I want to know. RWA 2017 - - Who Needs Sleep?